Ya’ll know I’ve partnered with my friend Amy Ellis to create Inspiring Stitches right!? Well, it’s time to reveal our 2019 Calendar Quilt. 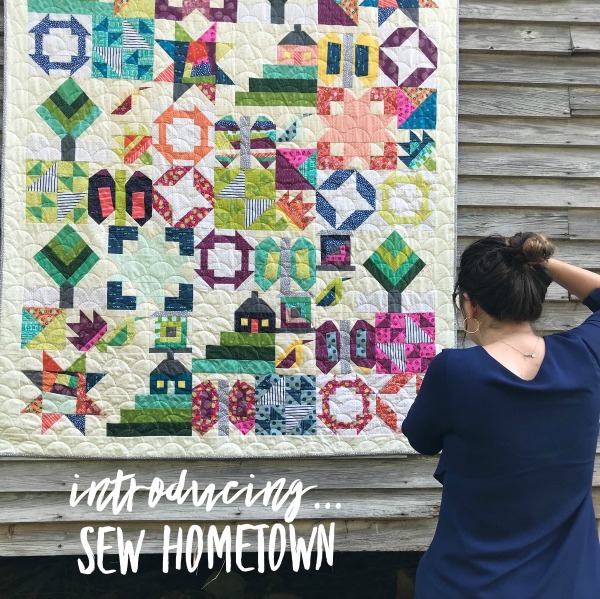 Allow me to introduce the Sew Hometown quilt design. 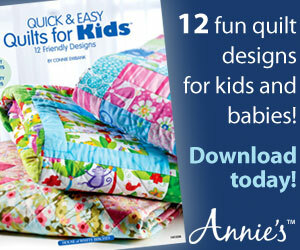 Not only is this pattern playful but it incorporates new techniques to help grow your skills. 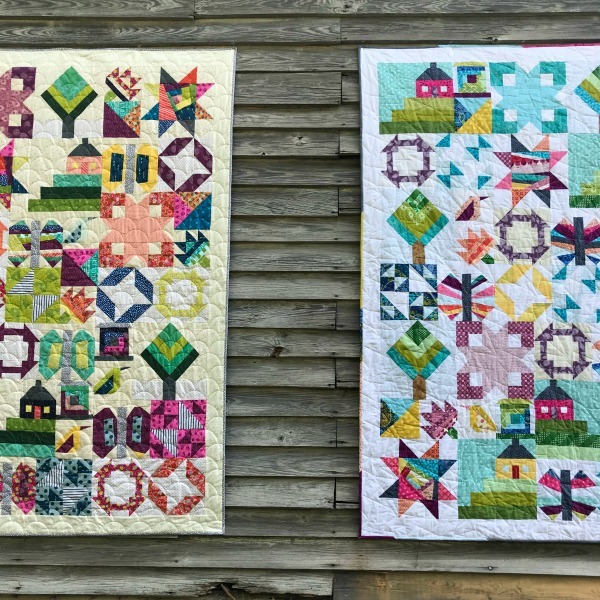 This year we wanted to help expand your quilting skills and encourage you to step outside the box with improv piecing. Improv is one of those techniques that just requires you to be open to something new. There is no right or wrong way to improv, it’s all about just letting the fabrics speak to you. 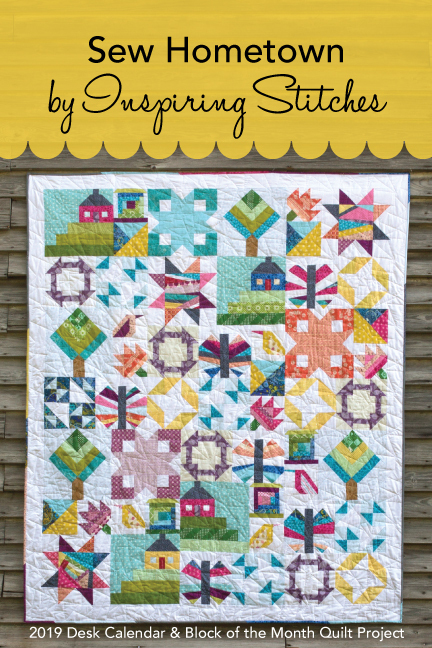 The Sew Hometown quilt is a block of the month project. Just like Heartland Heritage, this pattern is packaged as a free standing desk calendar. So, you will have something pretty to keep you inspired all year long. Let’s take another look at the variety this pattern offers. Amy and I both stitched our quilts independently and you can see that our finished quilts look very different. That’s right, these two quilts were made from the exact same pattern. It’s the combination of fabric and improv piecing that make them look so incredibly unique. Over the next few months we’ll be busy preparing for our booth at International Quilt Market in Texas, sharing additional photos on social media and making sure all the little details on our bonus shop projects are perfect. In the meantime, we hope you enjoy the sneak peeks and take advantage of our pre order special while you can. 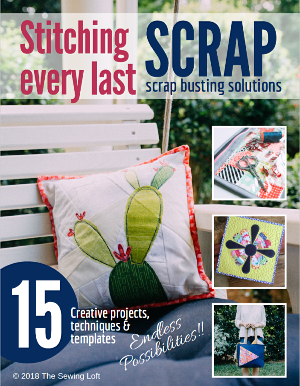 Attention Shop Owners- Are you interested in carrying our pattern and learning more about our exclusive Sew Inspired Society program? Email us at Inspiringstitches@gmail.com for more information. Together, we hope to inspire you to stitch a little more everyday. *Calendars will begin to ship in early October to give you plenty of time to shop for your project.